Owner Gunther Schmitz commented: “On an ongoing basis we receive portfolios of students who need to complete their 18-month practical. We then offer them an internship to complete their qualification." The company has been partnered with the college for several years and recently received a Partnership Certificate in recognition and appreciation of their commitment and continued support in 2017. 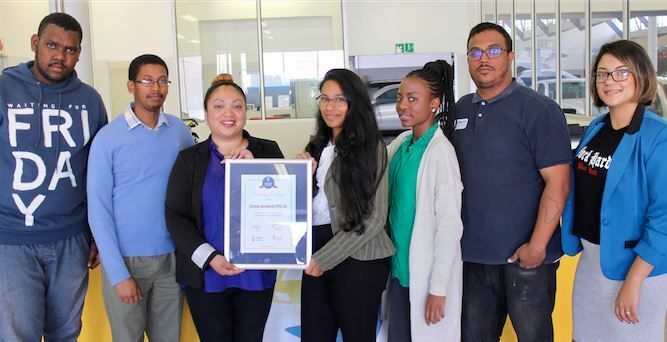 Currently Autoworks has two employees at its head office in Salt River, both of which started out as interns and are now employed full time. “I have always enjoyed working with young people and teaching them. From a business point of view, it is an investment as it is time intensive to train people. On top of that some people leave and some don’t work out. But the ones who stay end up being the most loyal employees. They fit in perfectly with the company culture and, by the time they have completed their internships, are valuable employees. It’s a long-term investment that pays off,” says Schmitz. Picture caption: Clinton Lyners is business management Intern, completing his 18-month practical. He started in February. Lucian Jonas completed his 18-month practical in business management. He is permanently employed as Autowork’s HR/IT Administrator. Jardine Griebelaar and Shanice Alexander are also business management interns currently completing their 18-month practical. They have been at Autoworks for a year already and ‘are showing very promising attributes,’ says Schmitz. Lindar Chitumba completed her 18-month practical in financial management and received her diploma. She is a rising star in the finance department. Keenan Fisher completed his 18-month practical in business management and is permanently employed as a Branch Quotes Assistant. Gina Davis, HR coordinator, works closely with the interns.